How Do I Add a Text Message Responses to the Notes Field of a Contact in Infusionsoft? When a contact responds to a text message you send them, you can add their response to the notes section of their contact in Infusionsoft. The notes section in Infusionsoft is extremely useful for storing conversations or important information about a contact. We do not add every response to the notes section of a contact as a default feature is that this would cause Infusionsoft to become clutter with somewhat useless information. In this article, we show you how you can selectively choose which contact responses get added to a contacts notes section in Infusionsoft. 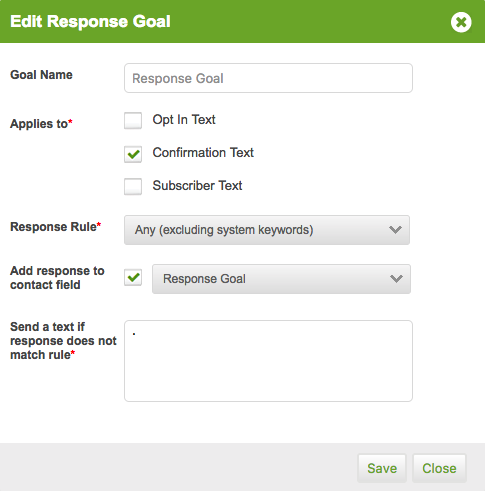 1 - Add a response goal off your send a text action. 3 - Add a tag applied action off your response goal. This will be used to enter contacts into your Infusionsoft campaign. 1 - Add a tag applied goal. Make sure you are using the same tag that is being applied to a contact in MOBIT when they achieve your response goal. 2 - Drag a sequence onto your canvas and connect this to your tag applied goal. 3 - Double click on your sequence. Drag an apply/remove tag process onto your canvas and remove the tag being used in your tag applied goal. We do this so a contact can continuously run through this campaign. Connect this to the start element. 4 - Drag an apply note process onto your canvas and connect this to your remove tag process. Double click on your apply note process. 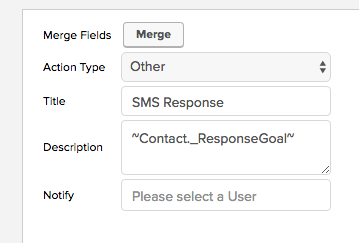 Set up your note, merging the custom field that is being used in your response goal. This is the field that a user's response is added to. 5 - Publish your Infusionsoft campaign.